Imagine Design » You Become Like the 5 People You Spend the Most Time With. 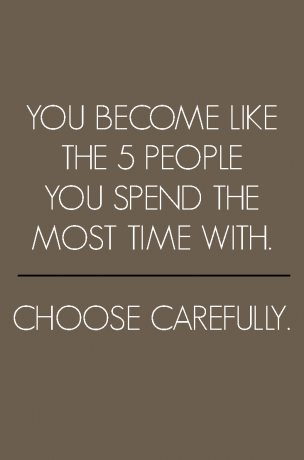 Choose Carefully. Food for thought! Have you ever caught yourself mimicking your friends or the people you hang out with? I think we all do this naturally. So if your goal is to be happy and successful, then hang out with happy and successful people. And don’t waste your time with those energy vampires! The mirrored gallery wall – how fabulous? I’ve actually been thinking about implementing this on my living room wall. I’ve started by hanging one yet I’m hesitant to add others in fear of the nail holes I’ll be putting in that wall! After seeing this image though, I’m feeling a bit braver! Happy Tuesday! I hope you’re off to a great week!